Risotto happens to be one of my Mum’s favourite dishes. If there was ever a seafood risotto on the menu when we ate out, she would order it. When, as a child, I asked her why she never made it at home she told me it always seemed too difficult to make. So after years of trying out different risotto recipes, some good and some not so good, I’ve learnt that one thing is absolutely essential: patience. Risotto rice takes a long while to cook and absorb the flavour you choose to use, to giving it the time it needs is vital. 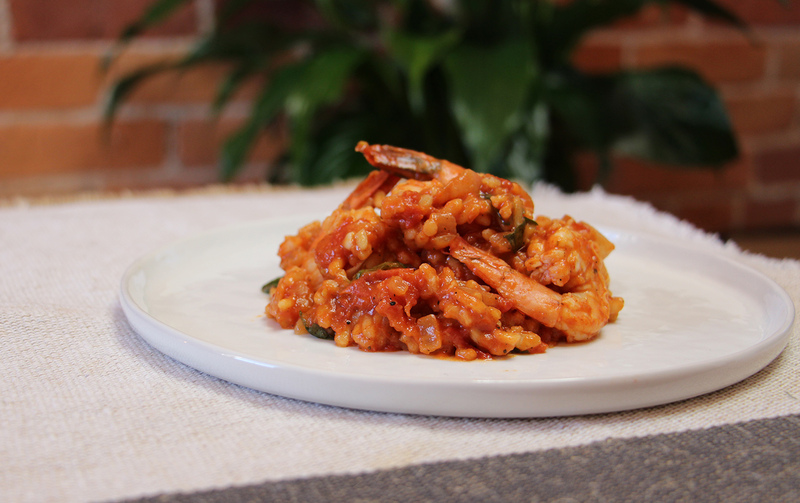 This recipe is a rich and creamy tomato based risotto, which uses fresh cherry tomatoes and basil leaves. The trick to this recipe is stirring the rice regularly, especially during the first 10 minutes or so, as this will help the rice cook evenly and stop it from sticking to the pan as it absorbs the stock. I like to serve this risotto with a sprinkling of vegetarian Parmesan, which is of course optional. Begin by boiling the stock in a large pan and leave to the side. Get a deep frying pan and put on a medium heat. Pour in the olive oil and add the onion, garlic and rice. Stir regularly to ensure all of the rice is coated in oil and does not stick to the pan. When the onions become translucent (this should take around 3-4 minutes) add in 1 ladel of stock. Keep stirring while the rice absorbs the stock and when it is completely absorbed , add another ladel of stock. Keep doing this until all of the stock has been absorbed by the rice. Next, add in the fresh cherry tomatoes and the chopped tomatoes. and stir into the rice. This should be followed by the sugar (to counteract the tartness of the tomatoes), the pepper and the paprika. Now you should let the risotto simmer for around 10-12 minutes, stirring regularly. 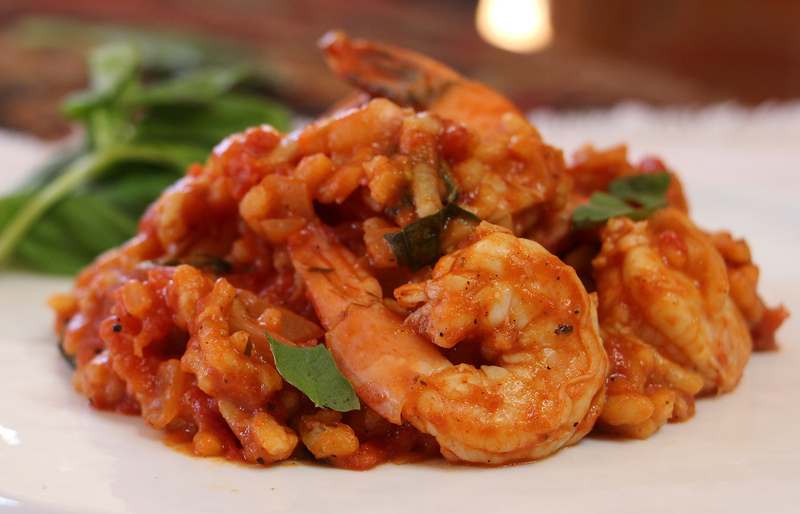 The next step is adding your shrimp. Make sure to coat them in the sauce so they cooked evenly and thoroughly. After around 3-5 minutes, the shrimp will pink all over and you're almost done! Add the basil and serve, sprinkling a little Parmesan on each serving. This looks amazing! Just discovered your blog and I can’t wait to dive into all your recipes. I’ve been hunting for what seems like forever for a really good Pescatarian recipe blog! Really nice images of that risotto, one of my all-time favorite things to eat. Glad you like the pics! We’ve been brushing up on our photography with a new camera. Just discovered your blog and it seems to be exactly what I’m looking for, looking forward to trying more recipes from you. This was really good. Followed the instructions except, added Salt in a few spots and more broth also cooked longer but my rice was “best” by March 2015. My husband even said it didn’t need the shrimp that’s a big compliment!! The risotto could stand on its own next time he doesn’t want shrimp and he’s a meat guy! !